Would you like to display your gallery images in random order? With Envira this is easy to do in a few simple clicks! This tutorial will help you in setting up your gallery images in random order. Why can’t I drag and drop my images? Ultimate, Agency, Pro, Plus or Basic Envira license. Learn how to purchase upgrade to one of these licenses. First you’ll need to create a new gallery or edit an existing gallery. If you need any help creating your first gallery, please review our documentation here. Your next step would be to select the Random sorting for your gallery. On the Gallery tab from the Sorting dropdown, select Random. When you select Random sorting, that sorting is applied to the images you see on the Gallery tab as well as what your visitors see when visiting the gallery on your site. Finally, just click Publish or Update on the gallery to save the random sorting. That’s it! Your gallery will now show the images in a Random arrangement with every page refresh. Would you like to try out Envira’s Gallery Widget? 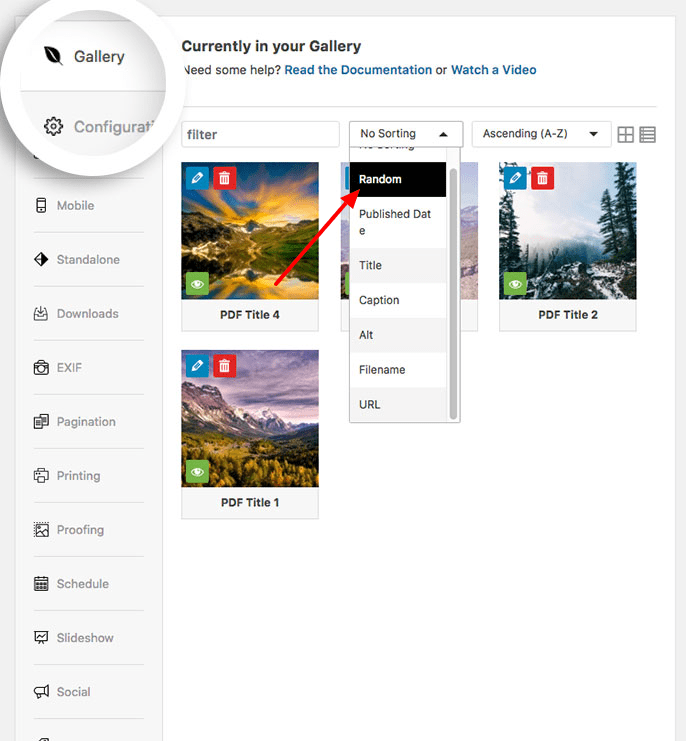 Check out our article on How to Use the Envira Gallery Widget. A: If anything but No Sorting is selected from the Sorting dropdown, the dragging or dropping of gallery images is disabled. To change this, simply select the No Sorting and click Update on the gallery to save the changes. You’ll then be able to drag and drop your images.